This knife has been in the making for quite some time now. Actually, it’s been waiting queue for engraving most of that time. The knife itself was finished about a month ago, but different and more urgent projects had to be completed before I could engrave it. The blade is made of damasteel, which is kind of stainless damascus made in Sweden. This knife was the first one where I’ve used that steel and I really-really like how it came out. The pattern on the steel is very fine and extremely beautiful. Now I want to make all knives from that steel, just need to find customers who can afford it :). Any takers? Engraving itself took 10 hours, design was about 3-4h. That looks so nice! 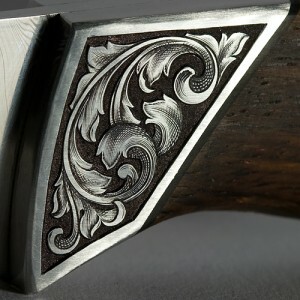 I really really like that blade too, and the engraving is just the right thing! I think that’s really cool that you are able to not only make the knife but also engrave it! Very exquisite. Is this something difficult to learn?